From left: Warped Serie Gran Reserva 1988 Robusto, Fuente Fuente OpusX Reserva d'Chateau, Bolivar Coronas Junior, La Aroma de Cuba Mi Amor Reserva Beso and San Lotano Requiem Maduro Robusto. The ratings from February’s Cigar Aficionado are now live on our site, and it certainly was an impressive tasting. The tasting totaled 81 cigars, and of those 34 smokes rated 90 points or higher, outstanding on our 100-point scale. That’s nearly 42 percent. We rated cigars in six size categories: Churchill, robusto, petit corona, corona gorda, figurado and panetela. 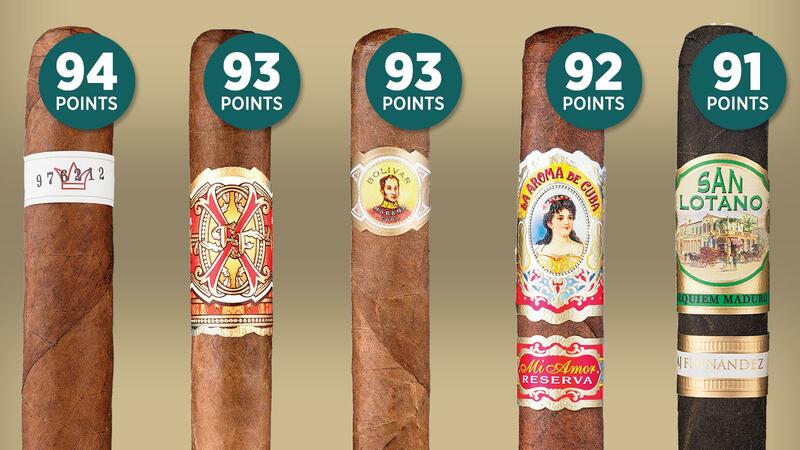 Nicaragua continued its dominance, as cigars made in the Central American country led half of the categories, with Dominican cigars close behind, taking the top spot in two categories. Cuba and Honduras each led one category. The robusto category was a 90 machine, with 10 scores of 90 points or higher, more than any other category. Additionally, the robustos section included the most 91-plus point cigars with five, including the top-rated cigar for the entire issue, Warped’s Serie Gran Reserva 1988 Robusto. Warped Serie Gran Reserva 1988 Robusto (Nicaragua, 94 points): Named for the birth year of brand owner Kyle Gellis, this Nicaraguan puro comes in one size only, a robusto measuring 5 1/4 inches by 50 ring gauge. See full tasting note. Fuente Fuente OpusX Reserva d'Chateau (Dom. Rep., 93 points): An all-Dominican mainstay powered by a shade-grown, Cuban-seed wrapper from the fertile fields of Chateau de la Fuente. See full tasting note. Bolivar Coronas Junior (Cuba, 93 points): This tiny Cuban measures a mere 4 3/8 by 42, but still packs a big flavor punch that leads with Bolivar's signature earthiness. See full tasting note. Arturo Fuente Hemingway Work of Art Maduro (Dom. Rep., 92 points): Alluringly dark and curvy, this perfecto is made by the Fuente family with a near-black broadleaf wrapper grown in the Connecticut River Valley. See full tasting note. Hoyo de Monterrey Epicure No. 2 (Cuba, 92 points): One of the few Cuban cigars also available in cabinets of 50, this smoke remains arguably Cuba's greatest robusto, measuring 4 7/8 by 50. See full tasting note. Archetype Strange Passage Short Robusto (Honduras, 92 points): Part of Ventura Cigar Co.’s psychoanalytically inspired Archetype brand, this cigar is rolled with Ecuadoran Habano wrapper and Dominican San Vicente binder. See full tasting note. La Aroma de Cuba Mi Amor Reserva Beso (Dom. Rep., 92 points): This cigar is rolled with the same Cuban-seed wrapper grown in Mexico as the traditional Mi Amor, only it comes from a higher position on the plant, making it darker in color. See full tasting note. Padrón Family Reserve No. 45 Natural (Nicaragua, 92 points): One of Padrón’s top brands, this toro measures 6 inches by 52 ring gauge. See full tasting note. San Lotano Requiem Maduro Robusto (Nicaragua, 91 points): Crafted by A.J. Fernandez, this cigar wears a Mexican cover leaf over a Nicaraguan binder with filler tobaccos from Nicaragua and Honduras. See full tasting note. Laranja Reserva Lancero (Nicaragua, 91 points): Inspired by the unique orange hue of the wrapper on this cigar, owner Erik Espinosa named the brand Laranja, which is the Portuguese word for orange. See full tasting note. Tatuaje Fausto FT114 Short Robusto (Nicaragua, 91 points): Owner Pete Johnson originally created this brand as a private blend for a Hawaiian retailer. Its name is from a discontinued vintage Cuban cigar brand. See full tasting note. CAO Nicaragua Matagalpa (Nicaragua, 91 points): This smoke is made with a wrapper and binder from the Jamastran region of Honduras as well as Nicaraguan tobacco from Jalapa, Estelí and Condega. See full tasting note. Partagás Short (Nicaragua, 91 points): At 4 3/8 inches by 42 ring gauge, this small cigar is almost like a condensed version of the huge Partagás Lusitania. See full tasting note. Punch Rare Corojo Champion (Honduras, 91 points): This popular brand is defined by an Ecuadoran Sumatra wrapper that maker General Cigar Co. says is grown in limited quantity. See full tasting note. San Isidro Geniales (Nicaragua, 91 points): This brand from HVC Cigars showcases an Ecuadoran wrapper around Nicaraguan binder and filler. See full tasting note. Alec Bradley Prensado Lost Art Churchill (Honduras, 91 points): This cigar is draped in a Honduran Corojo wrapper with two binders—one from Nicaragua and the other from Honduras, with filler also from Nicaragua and Honduras. See full tasting note. Vegas del Purial Gran Reserva Lancero (Nicaragua, 91 points): An Ecuadoran Sumatra wrapper covers the all-Nicaraguan bunch of this cigar, which is named for after the farm where brand owner Felix Mesa’s grandparents once grew tobacco in Cuba. See full tasting note.